Staunch Remain newspaper The New European has made a surprising advancement on leave-voting heartlands in the West Midlands, it can be revealed today. 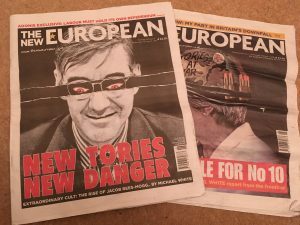 Since the beginning of February, free copies of the ‘pop-up’ newspaper edited by former Labour spin-doctor and arch Europhile Alastair Campbell have been landing on the doorsteps of homes in leafy Shropshire. Despite still only having a reported circulation of around 25,000, the papers are being delivered to homes in the safe Tory seat by a private delivery firm based in Stoke-on-Trent. Previously considered to be a very metropolitan, London-centric title, which is produced by a small team in Norwich, the weekly editions which are sold for £2.50 are being dropped off for free as part of other scheduled delivery rounds. Shropshire voted by a convincing 57% to leave the European Union when Britain went to the polls in June 2016. It is not yet known how many households this new assault on Brexit territory is targeting. The newspaper’s editor-at-large regularly refers to leave voters as “Brextremists” and to Nigel Farage as a “nicotine-stained man frog”. Contributors to the title include self-confessed racist Yasmin Alibhai-Brown who says “millions of Brits lack critical thinking and basic knowledge”, playwright Bonnie Greer who thinks Brexit is “driven by Angry White Men” and PR guru Mike Hind who suggested young people would “spit on the graves” of their grandparents for voting leave. In the latest two editions there are interviews with Gina Miller, Dan Snow and Labour peer Andrew Adonis who resigned from his position as chair of the government-backed National Infrastructure Commission after labelling the Brexit vote “a dangerous populist and nationalist spasm worthy of Donald Trump”.